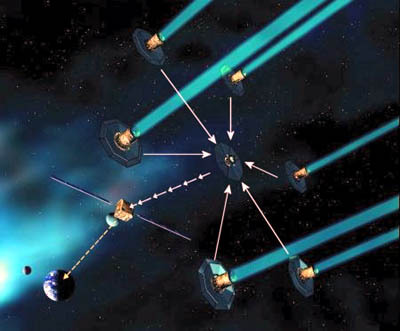 The concept of the Darwin Mission was first proposed in 1993 by the European Space Agency and studies were ended or put on hold in October 2007. It was envisaged that a constellation of four 3-4 meter infrared telescopes acting together would have worked like a single large telescope, with a diameter of up to several hundred metres. The object was to search for planets the size of the Earth for signs of life which is an extremely difficult thing to do. Even for nearby stars, it is like trying to see the feeble light from a candle next to a lighthouse 1000 km away. At optical wavelengths a star outshines an Earth-like planet by a thousand million to one. 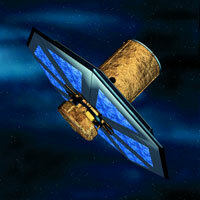 Partly to overcome this difficulty, Darwin proposed to conduct observations in the mid-infrared. At these wavelengths the star-planet contrast ratio drops to a million to one, making detection a little easier. Quite apart from this, Darwin’s observations would have been carried out in the infrared since life on Earth leaves some of its marks at these wavelengths in the form of infrared spectra. 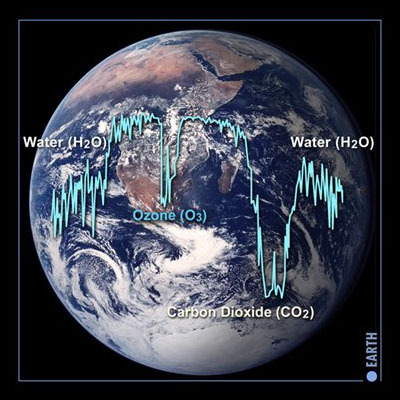 On Earth, biological activity produces gases that mingle with our atmosphere. For example, plants give out oxygen and animals expel carbon dioxide and methane. These gases and other substances, such as water vapour, leave their fingerprints by absorbing certain wavelengths of infrared light. Darwin would have split the light from an extrasolar planet into its constituent colours, using an instrument called a spectrometer. This would show the drop in light caused by specific gases being in the atmosphere, allowing them to be identified. If they turned out to be the same as those produced by life on Earth, rather than by non-biological processes, Darwin would have found evidence for life on another world. To meet its objective to find and investigate Earth-like planets, Darwin would have used a technique called 'nulling interferometry'. The light reaching some of the telescopes would have been delayed slightly before being combined again. This would have caused light from the central star to be 'cancelled out' in the resultant data. Light from planets, however, is already delayed between one telescope and the other since the planet is to one side of where the telescopes are pointed. By delaying the light a second time, the light from the planet would be combined constructively, showing the planet. If not for this 'nulling', the starlight would overwhelm the planet's feeble glow for Darwin to work, the telescopes and the hub must have stayed in formation with millimetre precision. ESA was planning to achieve this aim using a variation of the highly successful Global Positioning System (GPS) that provides so much of the satellite-based navigation on Earth. But this was not enough, as the light collected by the telescopes was supposed to be recombined at very high precision. A deviation of more than just 100 thousandths of a millimetre could have ruined the observation. Although this sounds like an impossible feat of accuracy, ESA together with European industry had started some of the pre-developments for the necessary metrology and optical equipment that would allow such precision. The illustrations below are taken from the European Space Agency's library on the internet and due credit is extended to ESA in reproducing them below.